Even though the snow has melted around our Wicked Warnings headquarters in Naperville, IL, plow season is still upon us. Last weeks’ record-setting low temperatures and the great deal of snow that fell throughout the Midwest has inspired our latest blog post. Today, we are featuring a recent plow truck strobe lights build. In this build, we’re highlighting a Ford F350 XLT Model Plow Truck. We used a number of our Wicked Warnings plow truck strobe lights to keep this truck seen and safe on the road. Watch the video below to see these plow truck strobe lights in action! From the front, you can see the Dual 8-inch LED Kit within the grille. This set is usually only sold for a Lariat grille, though our team at Wicked Warnings customized the install for the non-lariat grille application. This build also features the Atomic LED Cab Clearance Lights on the roof and our Wicked Warnings Mirror Mod Kit. We used our LIN-6 LED strobe lights in the top of the grille, and our TIR-3 strobe lights by the front fog lights. Four of the forward-facing LED plow truck strobe lights are activated by auxiliary switch number 5. Since this is a plow truck, we gave the owner the option to turn off the strobe lights in the front that might reflect off of snow or the plow. Along the side of this truck, our Wicked Warnings Thin-X in an amber-white combination is used within the F350 badge. You can also see the TIR-3’s within the fog lights that are used for both front and side warning. The TIR-3’s are synchronized with our LED HAW DUO in the tail lights. This gives a full picture of this vehicle’s length for traffic approaching from the side. The LED HAW DUO’s are used in both the cargo and tail lights and are synchronized in an X-pattern. The LED HAW DUO’s displayed in the rear of this truck also include our popular flood mode override feature. For this particular build, we also included the Carson 100 Watt Siren & Speaker Kit. Watch until the end of the video to see how we configured all of the auxiliary switches for activating the siren, air horn, and the strobe lights on this plow truck. If you would like to replicate this build, you can purchase the full kit here: Click here to purchase this kit. Each of the individual products used in this build can be purchased from our Online Store. 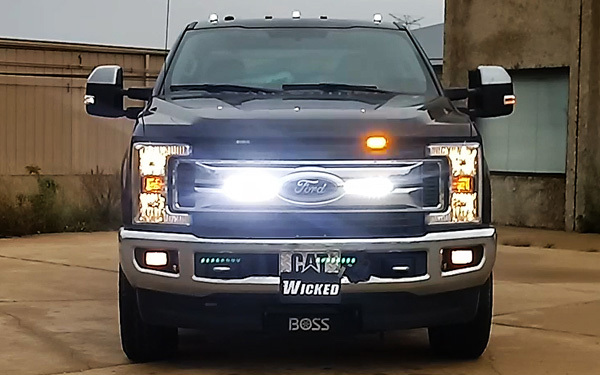 If you have any questions about our plow truck strobe lights, please send us an email at info@wickedwarnings.com.